When you toast a bride and groom with a flute of champagne or down a glass of your favorite red wine on the weekends, it can actually be good news for your body: One glass a day (or less) can make your heart stronger and may boost your memory. But have a few too many, and your risks for breast cancer, uterine cancer, and osteoporosis rise fast. So when it comes to drinking, should you or shouldn’t you? Here, experts make sense of the contradictions and help four drinkers (and one abstainer) find the healthiest imbibing strategy. Can a glass a day keep the doctor—and the pounds—away? Gabrielle Studenmund, 31, of Southern Pines, N.C., is trying to lose 10 to 20 pounds from her five-foot-five, 155-pound figure. She takes three-mile walks every day and watches calories carefully, but wonders whether giving up the glass of white wine (or sometimes two) that she has every night with dinner would make losing weight easier. At the same time, she doesn’t want to say no if wine is really helping her stave off Alzheimer’s disease, a heart attack, or some other scary health problem. The wine is probably doing more good than ill. In a study of almost 50,000 women, those who drank moderately (one drink per day) gained less weight than women who abstained—and less than those who had two or more drinks per day. It’s not clear why, but study author Eric Rimm, associate professor of epidemiology and nutrition at Harvard School of Public Health, thinks that alcohol may help burn calories. 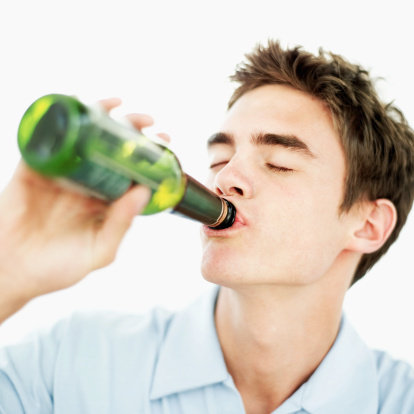 Plus, alcoholic beverages have no fat and typically have fewer calories than popular non-alcoholic beverages. A 5-ounce glass of red wine has 125 calories, for instance, but a Venti Cappuccino from Starbucks weighs in at 180. Still, Gabrielle needs to watch what she eats when she’s drinking. Since alcohol often lowers inhibitions, she runs the risk of noshing to excess. To avoid that problem, it’s best to portion out your goodies beforehand and put away leftovers quickly, says Katherine Zeratsky, a registered dietitian for the Mayo Clinic. Down the road, Gabrielle’s well-behaved taste for wine should pay off in a lower risk for dementia, heart disease, and certain cancers. Alcohol may keep her brain sharp by increasing blood flow upstairs, says David Hanson, founder of AlcoholInformation.org and professor emeritus of sociology at the State University of New York at Potsdam. Moderate drinking also seems to raise HDL (good cholesterol), and lower LDL (bad cholesterol), while decreasing blood pressure. It may even cut the risk of type 2 diabetes by improving the body’s sensitivity to insulin. How does alcohol pull all that off? Nobody knows for sure, Hanson says, although the calorie burning and improvements in blood chemistry linked to drinking may explain it. Will drinking too much make me age faster? Lisa Concepcion Giassa, 36, of Bogota, N.J., goes out every other night during the week with the girls for a pitcher of margaritas or sangria, and downs two to three drinks per outing. On the weekends she gets a little more crazy. “For me,” she says, “it’s five drinks and three shots, with water in between.” She prides herself on being the one who can put it away and still have her wits about her. Lisa isn’t oblivious to the immediate dangers—like car accidents or simply falling down—but she’s more worried about premature aging and the risks of a disease like breast cancer or osteoporosis. Studies clearly show, too, that more than one drink a day makes you more prone to breast cancer. Researchers at the European Cancer Conference recently reported that the risk rises 10% for women who have between one and two drinks a day, compared with women who have less than one, and the risk increases by 30% at more than three drinks per day. And don’t think you lower the risk by drinking wine instead of beer or something harder. The same research says any kind of alcohol ups the risk. Uterine cancer risks go up at two or more drinks a day, as well. What does alcohol have against breasts and uteruses? Experts say it seems to boost estrogen levels, which in some cases cranks up cancer risks.